We even tried putting on his diaper while he was standing up, but that is very difficult when his legs are squeezed together. Sometimes we double-team him, but even then it is still difficult. The closest comparison I can think of is calf roping at the rodeo. We may have to move diaper changes to the floor for safety precautions. Even though it is frustrating when it happens, I giggle through it sometimes. It's hard to get mad at someone this cute. Our church decided to do the Easter egg hunt the Sunday after Easter. It was called Sleep-in Sunday. We had the egg hunt at 4:15, mass at 5 and then a charity Italian dinner at 6. It was a nice event and Fletch raked in the eggs! He wasn't allowed to eat any of the candy inside the eggs. So Mommy and Daddy HAD to eat it for him. Fletch still isn't too sure about grass. 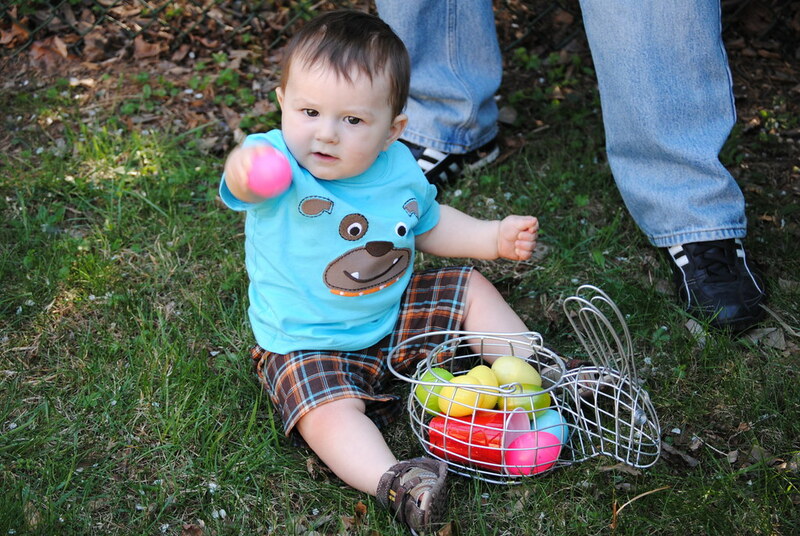 It took some coercing to get him to crawl in it, but once he saw the eggs he was motivated. After dinner, they busted out some fruit-bar popsicles and ice cream sandwiches. Since it was 100% fruit, I let Fletch try my grape popsicle. 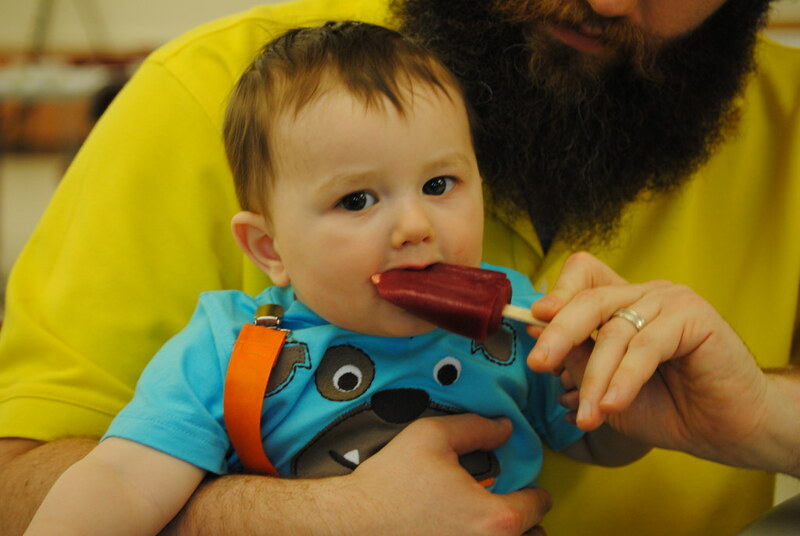 Sweet, grapey and cold...perfect for a teething baby! He had so much fun he passed out on the way home and went right to bed. Thank you Mister Easter Bunny! 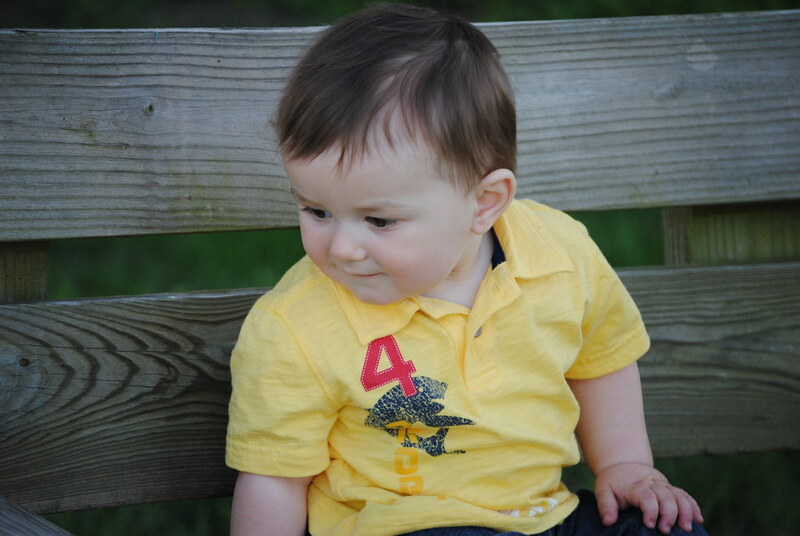 It's hard to believe Fletch is 9 months old and quickly approaching the 1 year mark. 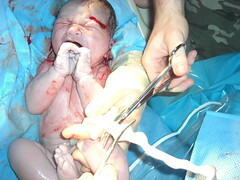 It was hard for our pediatrician to believe Fletch was only 9 months, even though she had her computer right in front of her. She started talking to us about giving Fletch cow's milk and eliminating bottles. Good thing I know my stuff, so I asked her why I'd be giving him cow's milk at 9 months and not at 1 year. She had completely forgotten Fletch was 9 months old. You see, he weighs 21 pounds and has a full head of hair. It tends to throw people off. Just look at this picture. He is starting to look like a little boy! He is getting to be such a big boy. He never ceases to amaze us. He is crawling all over the place and trying his hardest to balance standing up on his own. He has the cutest sounding conversations with himself. He has started holding his own bottle. He has two bottom teeth with more on the way. He is awesome. Fletch is doing amazing in swim class. I think he's part fish honestly. Could we possibly have spawned the next Michael Phelps? A mom can dream, right?